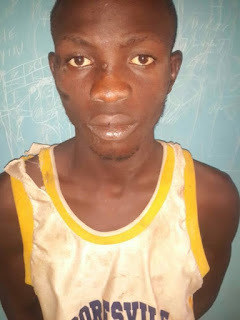 A 21-years old Isreal Oluranti has been arrested by the Nigeria Police, Ogun State Command for stabbing his friend Farooq Olusegun, 18, to death over accusation of phone possession. The incident occurred at Ope-Ilu area of Agbado Ifo local government area of Ogun State on the 25th of December. Trouble started when an argument ensued over a missing phone. Farooq accused Isreal of being in possession of his phone. This accusation infuriated Isreal consequent upon which he took one of the beer bottles around, broke it and stabbed Farooq on the chest. Meanwhile Farooq was quickly rushed to a nearby hospital but died before reaching the hospital. The father of the victim, Kolawole Abiola, lodged the complaint at Agbado Divisional Headquarter and the DPO, CSP Omonijo Sunday detailed Police detectives to the scene where the suspect was arrested. The Commissioner of Police, Ogun State Command CP Ahmed Iliyasu has ordered the immediate transfer of the case to Homicide Section of State Criminal Investigation and Intelligence Department for further investigation.